I regret to inform you that I am moving out this semester. I know this might come as a shock; I mean, I have lived here for the last two years, and they have been filled with amazing memories. Before you say anything, let me explain. Let me start off by saying that it is not just me. There are several of us who are feeling the need to move on. As for the reason I am leaving, you and I have changed over time. I remember when I first arrived at SNU; there you were, your brick and metal frame basking in the sun light as students rushed out to help carry my luggage up to my room, 410. Afterwards, it was all dorm games, shower saunas, mattress surfing, random nerf wars, movies, and staying up late discussing the complex questions that have perplexed humankind for centuries. Overall, there was one key component at your core, and that was relationships. You provided the best space on campus for friendships to be built. While not everything was quite so awesome, such as, the poor shower conditions, cockroaches and the smell that was too much for some people; those of us who found shelter there had a sense of camaraderie that members of other dorms can not fully understand. Even in the bad, you still had that central underlying goal, in which you created an area I could make friendships that will last a lifetime. So why am I leaving? It is because we have changed. I am not always quite so excited about the late nights and the freshmen running up and down the halls. I need some space to study; however, I still love the people. Mike went on to explain that what was most important to him was not the building itself, but rather the people who lived there. Although we leave Snowbarger, the relationships and friendship we made will live on. I asked every interviewee what advice they would give freshmen living in Snowbarger, and the general conclusion was to take advantage of living so close to so many guys. So freshmen, leave your door open, talk to each other when you pass the rooms, stay up late, have great discussions about life, because this time of your life is important. You have the chance to make friendships that will last not only through college, but far beyond your time here at SNU. 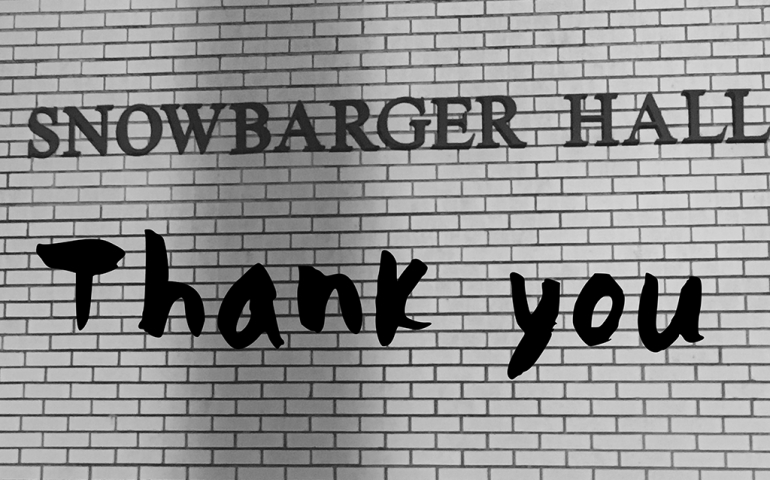 Thank you for the friendships and memories Snowbarger.